Today’s Exhaust Notes is chock full of racing information, including Sebring racing information, more Aston Martin DBR9 Gulf Oil pictures and news, plus the latest F1 safety car. The American Le Mans Series has become acclaimed as the Global Leader in Green Racing as both the U.S. Environmental Protection Agency (EPA) and U.S. Department of Energy (DOE) in conjunction with SAE International have proclaimed the Series as the only racing series currently to meet is criteria for green racing. All cars that compete in the American Le Mans Series run on either clean diesel, E10 or cellulosic E85. Audi has never lost at Sebring since its inaugural entry in 2000. This year, it will be tested mightily by Peugeot Sport Total, the “other” diesel race machine. The two had a classic head-to-head battle at the 24 Hours of Le Mans last year. Peugeot won the pole. Audi won the race. Both agree that the 56th Mobil 1 Twelve Hours of Sebring is a perfect warm-up for their next match-up at the world’s most famous endurance race. Acura entered the American Le Mans Series for the first time last year with a three-car effort. 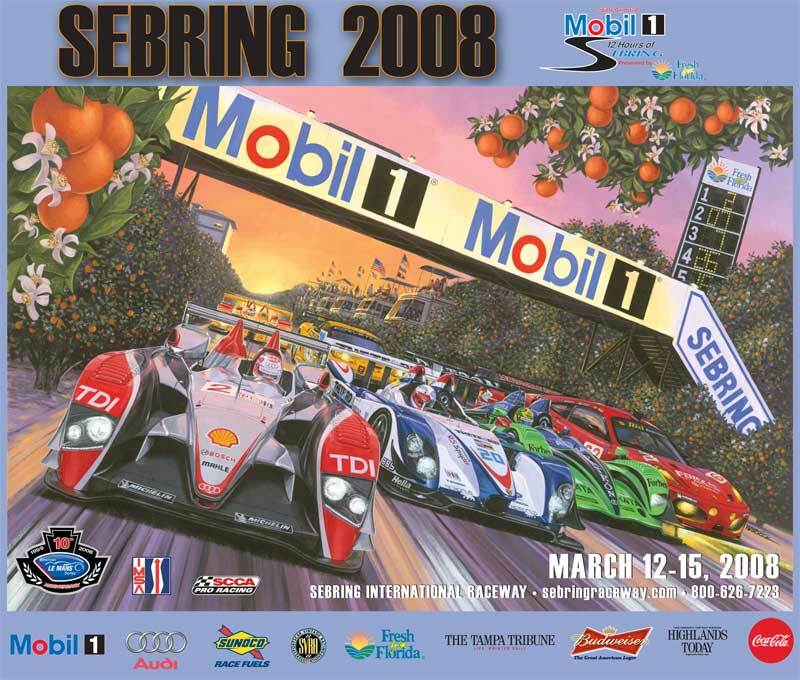 In its first 2007 contest – the Mobil 1 Twelve Hours of Sebring – the Andretti Green Racing team of Bryan Herta, Tony Kanaan and Dario Franchitti won the LMP2 class and placed second overall. This year AGR has Herta, Christian Fittipaldi and Marco Andretti behind the wheel of the new Acura ARX-01b. Andretti gives the famous racing family its third generation to compete in this historic endurance classic; Grandfather Mario is a three-time overall Sebring winner. Penske Racing, in 2007, became the first LMP2 class team to win overall more than one time in a single season. Prior to 2007, an LMP2 car had only won twice overall in the history of the American Le Mans Series. Last season, Penske Racing won eight times (in succession from Round 3 through 10), headed by six victories from class champions Romain Dumas and Timo Bernhard. Corvette Racing, which has won seven consecutive GT1 titles, ran virtually uncontested last year. This year, Bell Motorsports from Miami, FL will run a full-season Aston Martin DBR9. The last time Corvette lost was in 2006 (Laguna Seca) to an Aston Martin. Another Aston Martin (DBRS9) is entered in GT2 class, piloted by a former lord of Parliament. Lord Drayson served as Minister of Defense in Great Britain’s House of Lords until resigning to run a full-season in the American Le Mans Series in the Drayson-Barwell Motorsport entry that will run on a cellulosic E85 mix. Risi Competizione is back to defend its GT2 championship from a year ago with defending championship drivers Mika Salo and Jaime Melo. Last year at Sebring, Melo drove his Ferrari 430 GT to what was recently voted “The Greatest Moment in American Le Mans Series History” as he and Flying Lizard Porsche driver Jorg Bergmeister bumped and exchanged the lead twice in the final turn after 12 hours of racing before Melo took a 0.202-second win in the closest finish in race history. Audi’s Tom Kristensen, who has won four times at Sebring, can become the race’s all-time leader in overall victories this year. He is driving an Audi R10 TDI with last year’s LMP1 Series’ champions Allan McNish and Dindo Capello. Kristensen is also the all-time career leader in wins at the 24 Hours of Le Mans – seven (7). Corvette Racing’s Johnny O’Connell (Flowery Branch, GA) can break the record for consecutive starts at the 12 Hours of Sebring this year. He is currently tied with Hurley Haywood and Bruce Jennings at 17. O’Connell is schedule to drive the No. 3 Corvette with Jan Magnussen and Ron Fellows. Aston Martin Pre-Season Test – This is not worth mentioning, except that it gives SCD another opportunity to show more pictures of the Aston Martin DBR9 in the famous Gulf Oil livery. We apparently cannot get enough of it. Aston Martin Racing has hosted a pre-season test for both the factory team and private outfits at the Paul Ricard circuit in the south of France, following in the footsteps of the first such event that took place last year. As well as the two-car Gulf factory team of DBR9s that will compete at Le Mans, there were several customer DBR9s on track. The brand new Charouz Racing Systems LMP1 car powered by Aston Martin – which will be driven at Le Mans by Jan Charouz, Tomas Enge and Stefan Mucke – also took to the circuit for the two-day test. Aston Martin’s other racing cars at Paul Ricard included the new Vantage GT2, along with the DBRS9 GT3 car and several examples of the V8 Vantage N24, which will be competing in the FIA GT4 Championship this year. Aston Martin Racing fielded two DBR9s in Gulf livery – traditionally numbered 007 and 009 – in order to test the cars for the Le Mans 24 Hours. Amongst the drivers at Paul Ricard with previous DBR9 experience were Antonio Garcia, Andrea Piccini, Darren Turner and Karl Wendlinger. The newcomers to the DBR9 in France were Ryan Dalziel, Robbie Kerr, and former Grand Prix star Heinz-Harald Frentzen. Newest F1 Safety Car – Mercedes Benz has unveiled the new safety and medical cars that will be used during the 2008 Formula One season. The safety car is based on the SL 63 AMG while the medical machine is derived from the C 63 AMG Estate. Both have been developed by AMG and the Performance Studio. The safety car, which will be driven again by Bernd Maylander, was presented at the Geneva Motor Show. The car is powered by an AMG 6.3-litre V8 engine and has an output of 525HP. It can accelerate from zero to 62 mph in 4.6 seconds. The car is 220 kg lighter than the series-production vehicle. It is the eighth generation of safety car from AMG, who has been the official supplier to F1 since the 1996 season.